. In the old days it was a way to get you to continuously spend money by buying a new, better, improved products (just like washing powders), but today, its much more about keeping you secure. Think of it this way, all software is imperfect as amongst the millions of lines of code, there are errors, omissions and oversights that must be corrected. The primary driver behind all updates is to improve security and the news is full of reports of “good guys” finding flaws in the operating system. If the “bad guys” find these flaws first, they can develop new ways of infiltrating your PC or network, or just mess up your life with ransomware like CryptoLocker. The Windows operating system is as bad (or as good) as any of the rest as its riddled with bugs and security holes. Don’t get me wrong, its perfectly functional on a day-to-day basis, but every now and then it’ll crash for no apparent reason or refuse to operate in a proper way until you restart the PC. Whilst on the subject, it’s a great idea to “Restart” your PC or laptop at least once a week: By this I mean clicking on the window in the bottom left hand corner, clicking the power button and choosing “Restart” (not “Shut Down”). This is a different process to shutting down and powering on again and it often fixes little issues that may have been bugging you for some time. Back to updates - Windows has two different types of update; little day-to-day ones and then major version updates. The little ones download in the background and get installed without you being aware of it and they are usually of little importance to the user. The major version updates include not only a roll-up of all the little ones that may have been missed, but also fundamental changes and upgrades to how Windows works. Since Windows 10 was released in 2015 there have been versions 1507, 1511, 1607, 1703 and 1709 (note the year and month references) and we’re expecting 1803 any time soon. 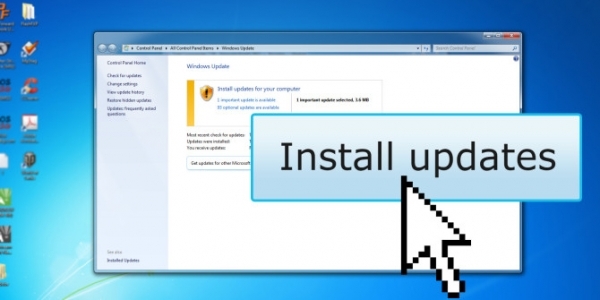 These updates should normally download themselves and Windows will offer to install it at a convenient time. There is no good reason not to do it but its worth noting that if your computer has issues before the update then it’ll probably have issues after the update as well. These updates can take an hour or so to install and there may well be more to follow afterward so be prepared. You can check your windows version by right-hand clicking the window in the bottom left-hand corner, clicking on “Run” and then typing “winver” and click OK. If you’re not on 1709 or higher then I would suggest downloading the Windows Update Assistant that will lead you through the update process and do it all for you. In addition to updates from Microsoft for Windows, Microsoft Office has its own update procedure and other software you use should be checked regularly for updates as well. As always, if you need help with this or any other technology you know where to come.